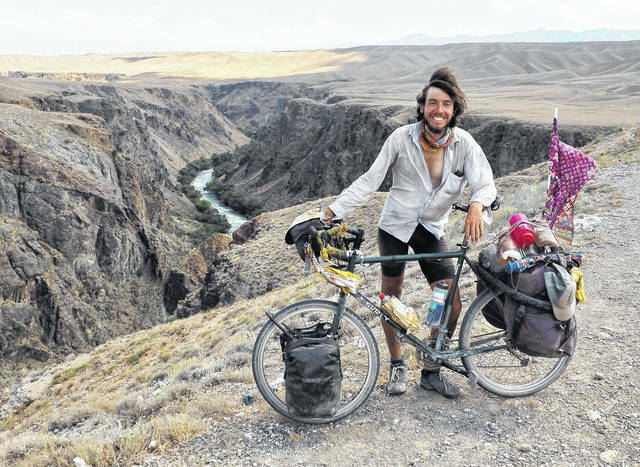 Liberty Township native Luke Miller spent the last year-and-a-half bicycle touring 15,000 miles across Asia. Miller is pictured along with his bicycle in Kazakhstan. Miller plans to spend another year-and-a-half touring the world on his bicycle. Liberty Township native Luke Miller is pictured riding his bicycle in Kazakhstan. While a 15,000-mile bicycle trip through 15 different foreign countries can teach a man a lot about himself, it can also provide insight into how people of other cultures live and treat others. 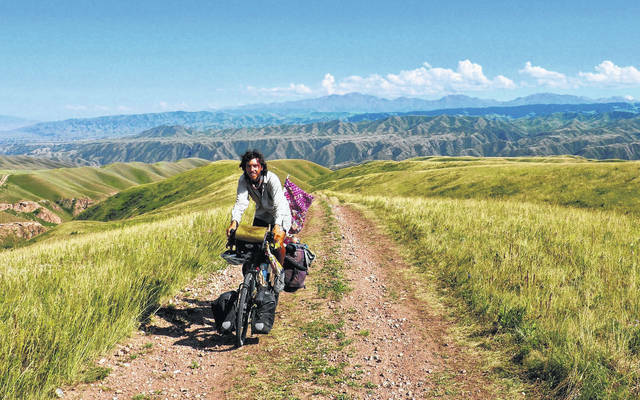 After spending the past year-and-a-half atop his bicycle touring Asia, Liberty Township native Luke Miller said the first half of his journey to see the world has taught him the people of Asia are full of generosity. Co-organized by the City of Delaware Sister City Advisory Board and Delaware City Schools, the presentation gave Miller the opportunity to share with his fellow Delaware County residents some of the highlights from the first leg of his bicycling touring adventure that included stops in India, Nepal, Bangladesh, Thailand, China, Mongolia, Vietnam, Laos, Cambodia, Myanmar, Kyrgyzstan, Tajikistan, Uzbekistan, Kazakhstan, and Azerbaijan. Before sharing his stories, Miller said while in Asia, he only encountered one American who was on a similar bicycle touring trip. With that in mind, he felt it was important to share what bicycle touring is all about. The four simple steps to bicycle touring, Miller said, are cycling all day, stopping to cook and eat as much food as possible, finding a place to camp for the night, and repeating the first three steps throughout the entire journey. While cycling through Asia with his father, Scott, who joined him for seven of the 18 months he was out exploring unknown lands, Miller said his favorite food was enjoyed in India. While there, he happened upon a village enjoying its “harvest celebration,” which he called the equivalent to Thanksgiving in America. “They were just so excited to have us there,” he added. In fact, Miller recalled, the entire 18-month trip consisted of similar encounters in which natives were eager to ask him questions about America and the “rights and economic opportunities” enjoyed by U.S. citizens. “I thought people had a very positive image of the U.S.,” he said. Whether he was American or not, Miller added his nationality didn’t seem to matter much as people simply saw him as a tourist and human being out bicycling through the elements. He said whether it was the nomads he encountered living in yurts throughout Mongolia or the people of Tajikistan — a country just north of Afghanistan that’s still recovering from a civil war that took place 20 years ago — the common characteristic shared by all was unbridled generosity. Another custom Miller quickly learned is that many Asian countries enjoy a particular beverage more than others — tea. He said villagers would invite him into their homes for tea. The tea would turn into dinner and the dinner into an overnight stay. As for staying safe in an area of the world far from the comforts of Liberty Township, Miller said the scariest moments didn’t involve people, but Mother Nature. In addition to the unpredictable storms, Miller also had to deal with extreme temperatures that ranged from sub-zero nights in the Tibetan Plateau to 100-degree days in Thailand. A 2010 graduate of Olentangy Liberty High School and 2014 graduate of DePauw University (Indiana), Miller was teaching English to elementary and middle school students in a small fishing village in southern Japan prior to deciding to begin his quest to see the world atop a bicycle. Miller said he was inspired to embark on the journey, in part, by his parents, Scott and Laura Miller. With 15,000 miles in Asia now under his belt, Miller said the plan is to cycle around the world for another year-and-a-half with the second leg of the journey to begin shortly in Kathmandu, Nepal, where he plans to meet up with Janneke Verhagen, a resident of the Netherlands whom he met also bicycle touring in China in April 2017. The plan, he said, is for the tandem to head west. For those thinking about giving bicycle touring a try, Miller highly recommends it. “It’s a great way to spend a few years traveling around meeting people from different countries, experiencing other cultures, and seeing famous places you’ve read about,” he said. Follow Miller’s adventures on his blog www.spokesandcoldoats.wordpress.com.